In 1990, Illawarra improved to win six of their last seven matches to finish in 9th position on the NSWRL first grade ladder. St George, however, had one of their worst seasons on record, finishing in 12th position in the 16 team competition. Kogarah Oval, 26 August 1990: The Illawarra Steelers have defeated St George 10-6 in front of a small crowd of only 5,709 spectators. The match ended a sad season for both teams with neither ever coming into semi final contention. As a result of the Dragon's poor effort in 1990, former skipper Craig Young departs as coach after just two seasons. 1990 saw the opening a modern grand stand at the western side of Kogarah Oval, increasing it's capacity. Winger, Ricky Walford has been selected for NSW in the 'State of Origin 90'. He was also on the Aboriginal tour of Tonga in 1990 for the Pacific Cup. Craig Young was replaced as coach in 1991 by former St George player and former Steelers coach, Brian Smith (pic left). Smith accepted the position after a successful coaching stint with Hull in the UK. 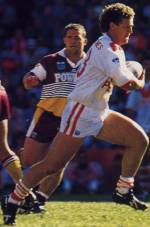 In 1991, St George and Illawarra again failed to qualify for the NSWRL first grade semi-finals. Both teams finished on 25 competition points with Illawarra (8th) ranked higher than St George (9th) due to a better for-and-against points differential. Adelaide Oval, 28 June 1991: St George have defeated Balmain 16-2 at the first ever premiership Rugby League match to be played in South Australia. A crowd of 28,884 saw Saints shut out the Tigers and score three tries. British flankman, Martin 'On Fire' Offiah was one of the try scorers for the Dragons. On loan for one year from Wigan, Offiah's occupation was listed as 'professional rugby league player' which in 1991 was considered a rarity. St George had a better season in 1991 finishing in 9th position while 'kindred spirits', Illawarra finished in 8th position and on equal competition, both teams two points shy of the semis. St George forward Scott Gourley gained selection for the Test series against Papua New Guinea, late in 1991. Son of former St George prop Robin Gourley, Scott has achieved a rare feat of being a dual international in both the Rugby Union and Rugby League. The Steelers kicked off the 1992 pre-season in fine style, winning the Tooheys Challenge. Led by captain Chris Walsh, Illawarra defeated the Brisbane Broncos 4-2 in a tryless final at Dubbo. In 1992, St George were runners up while Illawarra finished third, both teams battling it out in the NSWRL semi-finals. 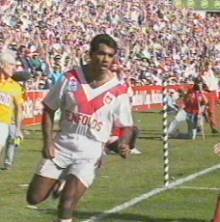 Sydney Football Stadium, 6 Sept 1992: Illawarra have defeated St George 18-16 in their debut semi final appearance. A crowd of 28,521 saw the Steelers down the Dragons and therefore qualify for the major semi final and two bites at Grand Final qualification. Centre, Paul McGregor starred in Illawarra's victory. Saints recovered to defeat Newcastle 3-2 in front of 38,772 people in a tryless minor semi-final (12/9/92). 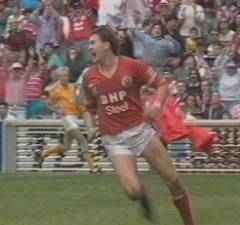 Meanwhile, Illawarra went down to Brisbane 22-12 in front of 38,859 spectators in the major semi (13/9/92) thus setting up a showdown between the two neighbours in the preliminary final. Sydney Football Stadium, 20 Sept 1992: In another low scoring and tight semis match, St George have come away as victors over Illawarra by just one try, 4-0 in front of 38,921 spectators. The match had it's share of controversy with referee David McCallum disallowing at least three Illawarra tries following forward pass rulings. Popular Dragons winger, Ricky Walford was the only try scorer of the day. WAV (247 Kb) click on speaker to hear Mark Coyne talk about 1992 preliminary final in an interview in the late 1990s. making the 1992 Grand Final but they did so in fine fashion under the guidance of coach, Brian Smith. Saints did well in the first half but the star-studded class of the Brisbane Broncos showed in the second half and they ran away winners to the tune of 28-8 in front of 41,560 people. Scorers for St George: Ricky Walford try, Ian Herron 2 goals. In 1993, St George were runners up for the second year running. Illawarra (7th) were struck hard by injuries and failed to qualify for the NSWRL semi-finals. The Dragons and the Bulldogs shared the top of the table after 22 rounds on 34 pts each. Canterbury are awarded the minor premiership by virtue of having a better for-and-against. The Dragons boasted a magnificent team in 1993 which included 1992 signings, Gorden Tallis, Jason Stevens Noel Goldthorpe, new 1993 signing Nathan Brown from MacLean in NSW (pic left) as well as experienced Scott Gourley and Mark Coyne, to name but a few. The club and players were stung by criticism at the beginning of the year that they didn't have what it takes to go one better in 1993. Punters and bookies had Saints at long odds of making the semis and even longer odds of 20-1 of winning the premiership. In 1993, Saints also debuted promising centre/five eighth, Anthony 'Choc' Mundine (pic right). The son of champion boxer, Tony Mundine, 'Choc' immediately makes an impression. WIN Stadium, 25 July 1993: The Steelers have thrashed the Gold Coast 26-0 in the round 17 match in front of 8,926 people. This was a highlight in an otherwise dismal year for the Steelers. Illawarra finished on 7th position and were unable to make the semis. Sydney Football Stadium, 26 September 1993: Saints were determined to go one better in 1993 and came into the semis as the form team of the competition. Their opponents, premiers Brisbane had a hard run into the semis and were beaten by St George in the final round of the competition, 16-10 at QEII stadium in front of 58,593 people, thereby forcing the Broncos into the dreaded sudden death fifth spot position. In their run to the Grand Final, St George disposed of Canberra 31-10 (4 September) and Canterbury 27-12 (12 September). Brisbane won their three matches also in convincing fashion but appeared to be struggling against Canterbury in the latter stages of the preliminary final which suggested that they may have be succumbing to rigors of elimination football. The 1993 Grand Final, played in front of 42,329 spectators, was later reported as the day the Dragons saved their worst game until last. Injuries to prop Jason Stevens (broken thumb in the opening minute) and centre Mark Coyne (knee cartilage after 25 minutes) put Saints on the back foot early in the match. Brisbane slowed down play with a huge defensive effort and effectively controlled much of the play close to the ruck. Saints were unable to respond and eventually went down without scoring a try. WAV (445 Kb) click on speaker to hear Mark Coyne talk about 1993 Grand Final. St George fullback and skipper, Michael Potter has announced his retirement from rugby league. The former Canterbury fullback came to Saints in 1989 and played 100 games, scoring 14 tries. Mick was always safe up back and was noted for his strong returns. Twice winner of the Dally M best player award (1984 and 1991). He was NSW rep before coming to Saints and missed out narrowly on national selection in the 1992 World Cup. poste script: Potter was to come out of retirement for one final year in 1995 with the Western Reds.